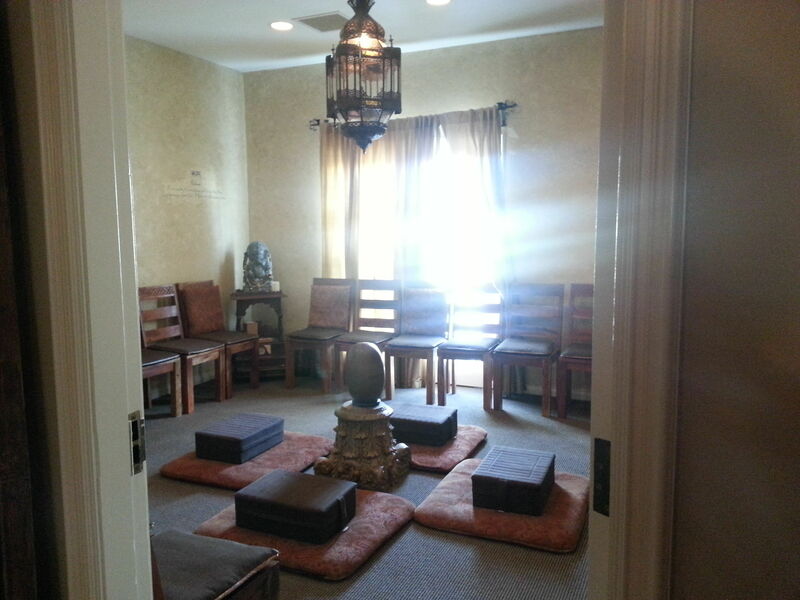 Meditation Room at the Chopra Center, Carlsbad, California. 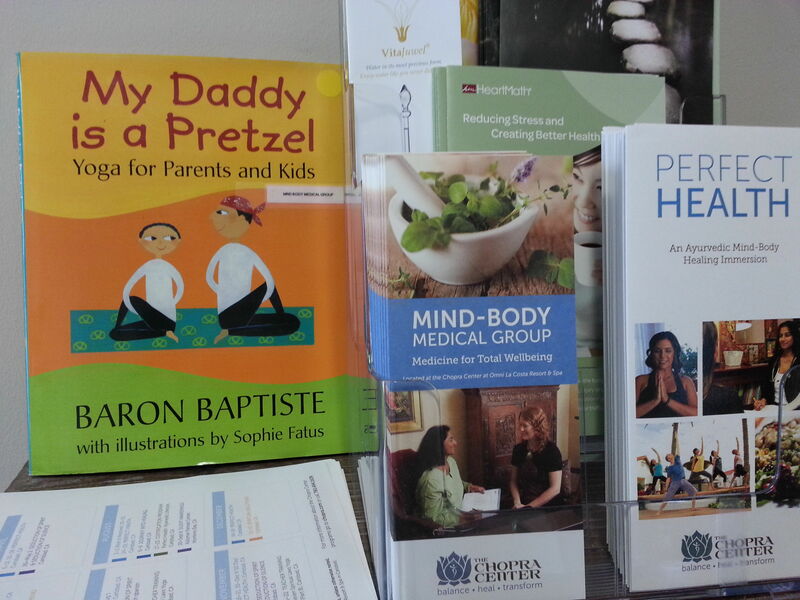 The Chopra Center's medical staff sees guests in their on-site offices. 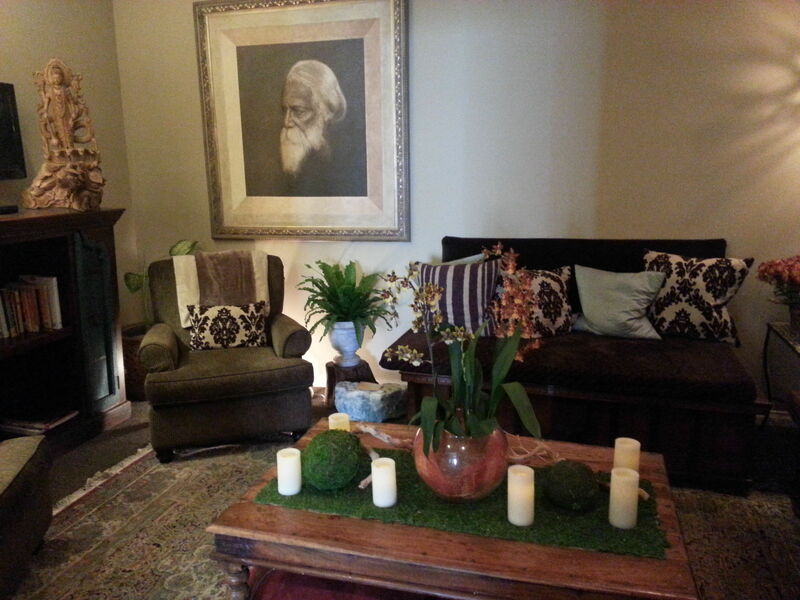 The cozy Dharma Room is where the purpose of life is explored. Indian Nobel Laureate poet Rabindranath Tagore watches over the Chopra library. It takes a visionary like Deepak Chopra to understand that in this day and age, being able to successfully achieve “Perfect Health” in one week is an irresistible offer. Anyone interested in practicing what Chopra preaches in “The Seven Spiritual Laws of Yoga,” or his 80 other books, should head straight to the Chopra Center for integrative wellness at the Omni La Costa Resort in Carlsbad. In full disclosure, as their guest, I spent only 24 hours sampling the program prior to co-hosting our annual TMS Family Travel Conference at the same wonderful resort. If not perfect health, I was ready to settle for relaxation, a bit of self-awareness, and a deeper focus to help me get through my conference tasks more productively. I found all that and much more, culminating in a plea bargain with my husband to make this one of our next vacation getaways. If you’re undecided about whether or not to try a Perfect Health retreat, I hope this account will help. The “Perfect Health” weeks offered by the Chopra Center are comprised of wellness talks, nutrition, daily massage, medical consultation with doctors trained in ancient Ayurvedic medicine as well as contemporary clinical medicine, yoga, self-reflection, guided meditation and quiet camaraderie. Participants take a “Dosha Quiz” based on Ayurvedic teachings when they arrive to determine their body types, then share the results and their medical records with on-site doctors who develop an eating and exercise plan to restore the body’s natural balance. Most attendees arrive with an open mind, perhaps with some yoga experience, and with a little understanding of meditation and its benefits. Classes assume zero skills and are gently guided by the Center’s excellent ayurvedic coaches, who talk guests through basic yoga moves while suggesting ways to build up to more advanced postures. Takeaways include nutrition charts that allow guests to check off all the food groups they consume each day to bring awareness to diet. I loved that my welcome fruit plate at the resort had dried blueberries, red grapes, apricots, pistachios, marcona almonds, green apples and an orange reflecting all the food colors we were encouraged to eat. Participants in the week-long program have an ayurvedic, vegetarian, cleansing diet at breakfast and lunch, prepared by the culinary staff and served at different spots around the resort. There’s no pressure to eat it, however, the simple Quinoa porridge breakfast at my visit topped with poached apples, dried blueberries, seeds and nuts from the buffet, was a filling and obviously healthful start to the day. At dinner, all of Omni La Costa’s restaurants serve a Healthy Living Menu with items like a rice and vegetable plate, more inspired by Chopra principles than by sophisticated Indian cuisine. Delicious herbal teas are available all day. There are several daily, welcoming yoga classes held indoors and out, for Perfect Health participants and the public. Weekends, the center runs a very popular drop-in family yoga class, which many hotel guests participate in. Our trainer, Treloar Hocking, said the Chopra practice was a Hatha or slow flow yoga. I would describe it as a leisurely stretch and deep breathing class with more of a focus on discovering your own body’s needs than building flexibility. The Ayurvedic Massage all guests begin with – Odyssey Enlivening Therapy — was a fascinating indulgence. My Ayurvedic healer Danielle was a skilled masseuse who had been trained at the center in the massage types suited to different Doshas. One woman I met who had arrived 48 hours before was feeling “completely transformed,” while the staff told me that by day five, they could see most guests transformed by the glow of good health. 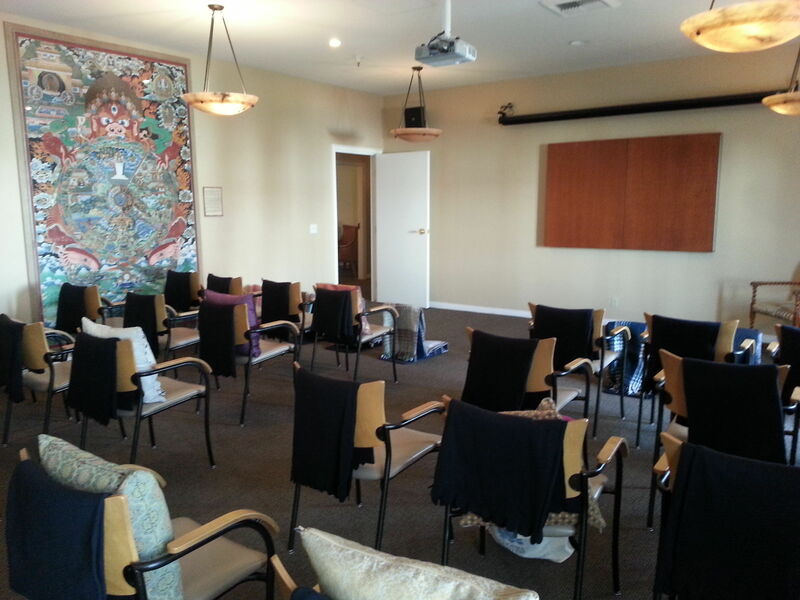 The Primordial Sound Meditation session met in the Dharma Room, a comfortable spot to explore the purpose of life. Our session was guided by a former Shell Oil engineer who talked us through the principles of concentrating on a sound or chant to help free the mind of the distractions of daily life. At the Chopra Center, each participant is given a personal mantra beginning with Om (the hum of the universe), followed by a Sanskrit phrase based on your birthday. While we closed our eyes, repeated our mantras and tried to clear our minds, she explained that the din of work would be a constant distraction we would try to overcome throughout a lifetime of practice. By the next morning’s yoga class I was looking forward to rising with the sun, stretching my body to feel where it hurt or had been replenished by sleep, and absorbing the peaceful ambiance of the center, in residence at La Costa for the past 11 years. Who Will You Meet at the Chopra Center? There were 25 participants in the week-long session I dropped into, ranging in age from about 25 to 85, about 80% women, dressed in everything from the latest line of Lululemon to college gym shorts. Morning yoga classes drew a much more diverse crowd from the center, the resort and the community at large. My Chopra Center guide, Blake Contardi, felt the Perfect Health program could be beneficial to older teens and had certainly seen many seniors graduate successfully. I could only compare it to the Ayurveda retreat I toured in Goa, India, which was about 20% of the price, but much more intensely Indian in style and substance. At the Chopra Center, these unusual Ayurveda concepts and language seem mainstream in comparison. The Chopra Center operates as a private institute within the sprawling Omni La Costa Resort, which also has its own famous La Costa Spa, the Premier Fitness Club weight loss center, and sports training, golf and tennis academies. La Costa is all about feeling good, making it the perfect base for the family who wants to up their game spiritually or physically while enrolling children, guilt-free, in the excellent supervised Kidtopia club. Rates for the Perfect Health program range from $3,175 for a six-day retreat to $4,375 for the 10-day retreat, including all classes, meditation, yoga, medical consultation, daily massages, breakfast and lunch. Note that Chopra Center fees do not include La Costa hotel accommodations, which range from enormous villas along the golf course suited to big families, to poolside double rooms for couples or girlfriend wellness getaways. Of course, many guests come just for a long weekend and sample the Center’s classes and facilities before a perfect health immersion. Bottom line, after 24 hours? While the Zenned-out state of relaxation I achieved in yoga and meditation sessions was short-lived, I was able to learn some tools to manage stress more effectively. And that sesame oil massage? Nirvana.